SCIENTIFIC CONFERENCES MAGEM %u2013 MARRIES MEDITERRANEAN, 29 June 2017. Seminar: Problematic Current of the Mediterranean Ecosystems. Place: Headquarters Marries Mediterranean (Ancient Station of Benalúa), Alicante. The web page of the MAGEM Master becomes manteined by the Faculty of Sciences. The up to date information on the Master will present in this page. The Master's academic Committee will study your case and as soon as possible will give you response. (In anticipation that the resolution be positive) is advisable that you consult the timetables and asistáis classes. Open the third deadline for enrolment in the master MAGEM from September 8 to October 5, 2014. The presentation of the thesis of Master (TFM) of Master analysis and management of Mediterranean ecosystems (MAGEM) at the University of Alicante will take place this Friday, September 5, at 10:00 h at the Emilio Elizaga room of the Department of Earth Sciences (fac. Science II, first floor). The exhibitions will take place in alphabetical order. Please try and test before the presentation room will be reserved overnight Wednesday and Thursday to do so (ask the Secretary of the IMEM). Second phase of pre-registration in MAGEM Master: from July 3 to September 7, 2014. The inauguration of the Master MAGEM for the academic year 2014-2015 will take place on 10 September at the headquarters of the Institute MIES Ramon Margalef. Attached schedules for the new course. 1. Call for June. Deadline to deliver the work until Friday, June 13. Date: June 27 (additional time and place). 2. Call for September. Deadline to deliver the work until Tuesday, July 22. Date: 5 September (additional time and place). Grant to students annex I assistance for support of the work master's student of MAGEM (BOUA of 9 may 2014). Students should be in contact with the Secretariat of the IMEM to initiate recovery procedures. 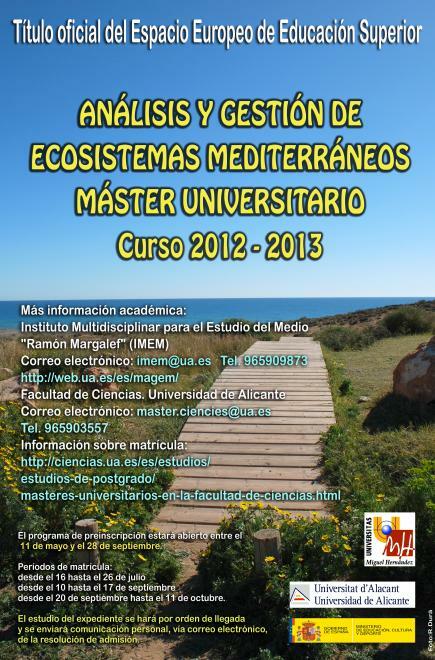 CALL FOR GRANTS FOR SUPPORT OF THE MASTER THESIS FOR STUDENTS OF THE MASTER OF ANALYSIS AND MANAGEMENT OF MEDITERRANEAN ECOSYSTEMS OF THE UNIVERSITY OF ALICANTE. The deadline for submission of applications ends on Friday, May 23, 2014. V CONVOCATION of scholarships to study masters official of the AU, to alumni, teachers and researchers belonging to public universities in Latin America or neighbouring ACP countries. The grants represent a unique opportunity for alumni, teachers and researchers from institutions of higher education of Latin America and countries of Africa, Caribbean and Pacific (ACP) to pursue a Masters of one year duration and nature face to face, at the University of Alicante, during the academic year 2014 / 2015. The deadline for submission of applications begins February 3 and ends March 3, both inclusive. 1. This Friday 25 October 2013 at 17:00 o'clock Emilio Elizaga (Dept. held the MAGEM presentation in the classroom Earth Sciences), Fac. Sciences II, 1st floor. This meeting, which is convened to the / pupils, the coordinators of the master's degree will be it. 2 Thursday, November 7, 2013 there will be, in the classroom teaching of MAGEM, the meeting with the Professor Alfonso Ramos (of the subject of the Mediterranean Sea), from 9:00 to 11:00 h, to develop the outlet to the sea for the subject. The reading of the final Master work will take place on Monday, October 14. The time and place to be determined. Works shall be submitted two weeks before in the Secretariat. Academic committees will conduct a first evaluation requests registered till 23:59 o'clock of 7 July (local time). A second evaluation will be made with requests between 0:00 on 8 July until 23:59 pm h. of 5 September (local time). A final evaluation will be made with requests between 0:00 h. on September 6 and 23:59 hours of 8 October (local time). Schedules of classes in the second semester of the Master MAGEM. The subject of FRANCISCA GIMÉNEZ "Communities and SEASCAPES" is pending confirm the schedule; interested students can contact her. Exposure of the Master project will take place on Tuesday 20 November at 11: 00 h in classroom seminars in the Department of ecology (phase II of science, 1st floor). Monday, October 15 will take place the presentation of the Master in the Department of ecology video classroom (phase II of science, 1st floor) at 11: 30 pm. see you! The theory of "Mediterranean Sea" class will take place at 12: 00 in the aulario I (A1/2-65S). 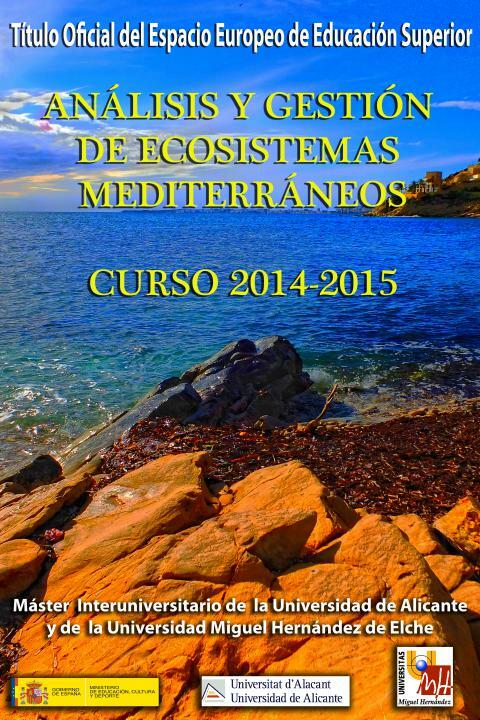 The class of "Interactions of organisms in Mediterranean environments" will be in the aulario I (A1/2-65S) at 16: 00. The class of "Geomorphology and hydrology" will take place in the lecture I (A1/015S) at 19: 00. Exposure of the Master project will take place Tuesday, July 3 from 10: 00 in the phase II of Science Seminar of ecology (1st floor). From the next academic year 2012-2013, Master MAGEM will have a substantial burden blended learning (both the AU and the UMH), being only mandatory practices, concentrated in a short period of time. Open the pre-registration deadline for the Masters for the 2011-2012 academic year. Exclusive on-line pre-registration from 1 to 7 June. Provide a comprehensive understanding of the environment with strong theoretical foundations of essential matters to deal with his study. Create in students the knowledge, skills and skills for the theoretical and practical study of Mediterranean ecosystems aimed at the analysis, diagnosis, and performances in them. New: can apply students are able to obtain the degree in the academic year 2010-11. As shown in ANECA after evaluating the report submitted to the Master Magem 2011-2012, the term "Final Master Project" should be replaced by "Final Master." In addition, the description of the curriculum in the second semester, 30 credits are divided into 18 credits of specialty + 12 credits Final Master. Shortly be informed of the place and time of test performance. Finally the dates proposed for the excursion End of Master MAGEM will be the ones of the 2 to the 5 of June (included) and with the same itinerario that initially designed. The interested will have to send the confirmation by means of electronic post to imem@ua.es. The address of Magem, is organizing a field trip excursion under mode 4 days' duration. The proposed schedule is 5, 6, 7 and 8 next May, leaving at 6.45 pm on June 5 and arrived at 22 pm on Sunday. Points of interest are: Cap Blanque, Cabo Cope, Cabo de Gata-route probably marine. Crossing the Natural Park of Sierra Nevada, from the Alpujarra, PN Sierra de Baza and from Alicante. The vehicle is a bus of 18 seats, the property is paid in advance for students and teachers and the return would I be reimbursed for the amount paid. Those interested can send an email with your details Imem@ua.es before 21th March.